Now that Iran nuclear deal is completed, the attention of western news media and political commentators is predictably focused overwhelmingly on the opposition to the agreement within the US Congress and from Israel and the Saudi-led Sunni Arab coalition. That media lens misses the real significance of the Joint Comprehensive Plan of Action, which is that Iran succeeded in negotiating an agreement with the United States that upheld its national right to a nuclear programme despite the obvious vast disparity in power between the two states. That power disparity between the global hegemon and a militarily weak but politically influential regional “middle power” has shaped not just the negotiating strategies of the two sides during the negotiations but, more importantly, how they came about in the first place. The news media have adopted the Obama administration’s view that negotiations were the result of Iran responding to international sanctions. The problem with that conventional view is not that Iran wasn’t eager to get the sanctions removed, but that it was motivated to do so long before the United States was willing to negotiate. In fact, Iran had long viewed its nuclear programme not only in terms of energy and scientific advancement but also as a way of inducing the United States to negotiate an end to the extraordinary legal status in which Iran has been placed for so long. Even during the Bill Clinton administration Iranian strategists wanted to get the United States to move toward more normal relations, but Clinton was determined to be the most pro-Israeli administration in US history, and instead imposed a complete trade embargo on Iran. Clinton eventually offered a “dialogue” with Iran but made it clear that he had no intention of giving up the sanctions against Iran. The lesson that Iranian strategists, including then secretary of the Supreme National Security Council and now President Hassan Rouhani, learned from the Clinton years was that the United States would only negotiate the end of its sanctions against Iran if was convinced that the cost and risk of refusing to negotiate was too high. It was during the second Clinton administration that Iranian strategists began to discuss the idea that Iran’s nuclear programme was its main hope for engaging the hegemonic power. Iranian political scientist Jalil Roshandel, who worked on a research project for the Iranian Foreign Ministry’s think tank in 1997-1998, recalled in an interview with this writer that influential figures (including an adviser to veteran Iranian foreign minister Ali Akbar Velayati) had told him during that period that they believed a uranium enrichment programme would provide leverage in negotiating a removal of the sanctions. Iran tried to use what it assumed was US and European concern about its enrichment programme – which had not yet begun enriching uranium – to gain more leverage in negotiations with the British, French and German governments from November 2003 to spring 2005. But those negotiations were fruitless, mainly because the Bush administration was interested in regime change in Iran and therefore disdained the idea of actual negotiations over its nuclear programme. The Bush administration ordered its European allies not to respond to a March 2005 Iranian proposal that offered to limit the Iranian programme to a minimum. The problem was that the Bush administration still didn’t take the Iranian nuclear programme seriously, so the power disparity between Washington and Tehran was still too great. And it wasn’t only the neoconservative-influenced Bush administration that believed it was so powerful that it need not reach a compromise with Iran. We now know that President Barack Obama relied on efforts to coerce Iran rather than negotiating with it during his first four years in office. He approved a plan for an unprecedented cyber-attack on Iran’s Natanz enrichment facility in 2009 as the first move in a strategy of pressure on Iran aimed at forcing the Islamic republic to give up its enrichment programme. For the Obama administration, intrusive financial sanctions were not originally conceived as a way to bring about a negotiated agreement with Iran. In fact Clinton publicly presented the “diplomatic path” with Iran as a way to “gain credibility and influence with a number of nations who would have to participate in order to make the sanctions regime as tight and crippling as we want it to be”. In other words, diplomacy was actually a gimmick to achieve the administration’s real goal of coercion. In 2012, when Obama was offering talks on Iran’s nuclear programme for the first time, he was still committed to the same strategy of coercion. The effort to bring Iran to the negotiating table was accompanied by yet another US cyber-attack – this time on the Iranian oil and gas industry. Only in 2013, during his second term, did Obama’s administration give up the aim of forcing Iran to end enrichment entirely and agree to actually negotiate with Iran on the nuclear issue. That decision came only after Iran had increased the number of centrifuges enriching uranium to more than 9,000, with another 9,000 centrifuges installed but never connected, accumulated a large stockpile of low enriched uranium, and – even more alarming to the United States – began enriching uranium to 20 percent. So the main back story of the nuclear agreement is that it was Iranian counter-pressure on the United States through its nuclear programme that finally compelled the Obama administration to change its strategy of relying mainly on coercion and begin the negotiations that Iran had wanted for more than two decades. The most important story of the agreement itself, moreover, is how the Obama administration, supported by its European allies, tried to maintain the sanctions for long as possible in the implementation process. But in the end US negotiators finally gave up that objective, even though, as Iranian diplomats told me in Vienna, they found the American “emotional attachment” to sanctions still manifesting itself in the last days of negotiations in the language of the UN Security Council resolution. The basic inequality of power of the two main protagonists, which would normally have allowed the United States to prevail on the issue, had been reduced dramatically by two factors: the lifting of sanctions was so central to Iranian interests that its negotiators would undoubtedly have walked away from the talks if the United States had not relented, and the Obama administration had become committed to completing the negotiations simply by virtue of having made such an agreement its central foreign policy initiative. 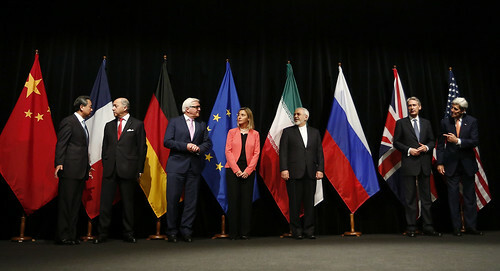 The Iran nuclear agreement thus illustrates the elemental importance of the distribution of power but also the possibility of a weaker state achieving its vital interests in negotiations with the hegemonic power against what might appear to be very long odds by exploiting their source of leverage to the maximum with patience, courage and careful calculation. This entry was posted in All Posts News Politics and-or Videos, Iran, Nukes, Politics and tagged Gareth Porter, Iran Israel US Nukes, Iran Nuclear Deal, Sanctions. Bookmark the permalink. The US-Iran nuclear agreement is a victory for US imperialism and a danger to the Iranian nation and people. This agreement affords the US its demand of limiting Iran’s nuclear-energy program and imposing draconian restrictions on Iran’s independence and territorial integrity. The only apparent advantage to Iran from the agreement would be the lifting of the sanctions; however, such lifting only figures in the agreement as a promise to be implemented in the future. While the process of lifting of sanctions by the Europeans is in the agreement, the lifting of the US embargo is not even addressed. Moreover, according to the US administration, removal of any sanctions is accompanied by a provision that will allow the sanctions to snap back into place as soon as a problem is perceived with Iran’s compliance with any of the many intricate requirements. l This analysis is a mighty big stretch of the facts. The fact is that Iran, which never tried to make a nuclear bomb, which had a legal nuclear program, was bullied by the world’s most powerful empire to submit to the hegemony and kowtow by giving up much of its sovereignty. We should not be applauding this imperialist crime, or pretending it is a victory for Iran. I agree with Chris Driscoll (where’s the “thumbs up” button? ).